Tips for Throwing an Impromptu Fourth of July Celebration | Tuesday’s Tip of the Day! With Fourth of July just around the corner, chances are you may still be humming and hawing over whether you want to throw a red-white-and-blue cookout. If that’s the case, I’ve got your last-minute festivities covered! I say this a lot as it relates to a lot! From nail polish color to makeup and Thanksgiving dinner, less is quite often more! The same goes for throwing a patriotic bash! Purchase as much as you can that’s pre-made and ready to either be assembled, tossed, bedazzled or hung and you’re ready to go! No one minds sitting on plastic chairs, eating off their laps, sipping out of plastic cups and noshing on paper plates when they are surrounded by family and friends in a casual setting. Keep the dishes at bay by serving your bites and sips on disposables, red-white-and-blue themed if you can find them. It’s amazing how something as simple as lit candles, music, freshly cut flowers, a roaring fire and stringing lights can enhance the overall ambiance. And, chances are, you may already have most of these on hand or can easily purchase them at your local shopping mall. Create a big pitcher of lemonade and keep a few bottles of bitters or flavored liqueurs, like watermelon Schnapps, on the side for those 21 and over to adorn! This way, kids and adults alike can enjoy a refreshing beverage. Don’t forget big coolers of beer, rose and any other sips you may enjoy! Save yourself a headache and create a simple and streamlined menu. If you over complicate your menu, the next thing you know you’re trying to find room on the grill for everyone’s specifications–not to mention all the variations of buns–and more room for those 6 other side dishes. Offer a veggie and meat main course, 1 type of bun, fixings, condiments, fruit salad, pasta salad, corn if you want, and coleslaw. Easy! I love the idea of smore’s as they are made by the guests and one less thing for you to do! If you don’t have access to a bonfire, consider buying a store-bought angel food cake–bonus points if you make one yourself–and dolloping with whipped cream, strawberries and blueberries for a festive, but simple, light dessert following your bountiful supper. Wonton Wrappers & Impromptu Weeknight Ravioli! | Tuesday’s Tip of the Day! Today, we are stepping outside of the box and introducing a whole new concept when it comes to making ravioli. Wonton wrappers, readily available at most grocery stores, make for an easy replacement with your classic pasta sheets and yield the same texture and outcome when cooked. Heck, your guests may not even know! In fact, because they are so simple to use–and save time from rolling out fresh pasta dough by hand–wonton wrappers frequently make an appearance in my kitchen. Make a filling for your ravioli: Open your fridge and consider the possibilities. Some of my favorite fillings are the simplest. For example, ricotta, fresh herbs, an egg, parmesan cheese, salt, and a crack of pepper is one of my favorites! Make a sauce, keep it hot! Bring a large pot of heavily salted water to a boil: For faster results, salt the water after it reaches a boil. Lightly flour a parchment paper lined baking sheet. ightly flour a work surface with flour. Lay one wonton wrapper down and place a small spoonful of filling in the middle leaving a 1-inch boarder around all four sides. Using slightly wet finger tips, “brush” a thin layer of water around each side, as if you were “licking” an envelope. Place the second wonton wrapper on top, and using a fork, gently press down along the sides forming a seal. Transfer to the prepared flour dusted parchment paper, and repeat with the remaining wontons. Cook: In a large pot of salted boiling water, working in batches if needed to not overcrowd the pot, cook ravioli for 2 – 3 minutes, or until done. Sauce & Serve: Using a slotted spoon, remove cooked ravioli, and transfer directly to your sauce. Toss and serve while hot. For other terrific tips and hundreds of recipes, like my walnut and kale pesto, a classic tomato Pomodoro sauce, or even my classic Bolognese, visit my website (thetabletogether.com). While there, consider “subscribing” and I will send a new tip or blog post directly to your inbox every Tuesday and Wednesday morning! Hasselback potatoes are all the rage right now! Show-stopping, jaw-dropping, spectacular “how the heck do you do that” kind of rage. The best part, although so sophisticated to the eye, is that they are easy to make and just require a few tools and steps before the oohh’s and aahh’s set in. And, if you find that your giving yourself high fives–because if anyone else was there they would be the receiving end of your excitement–I don’t blame you one bit! 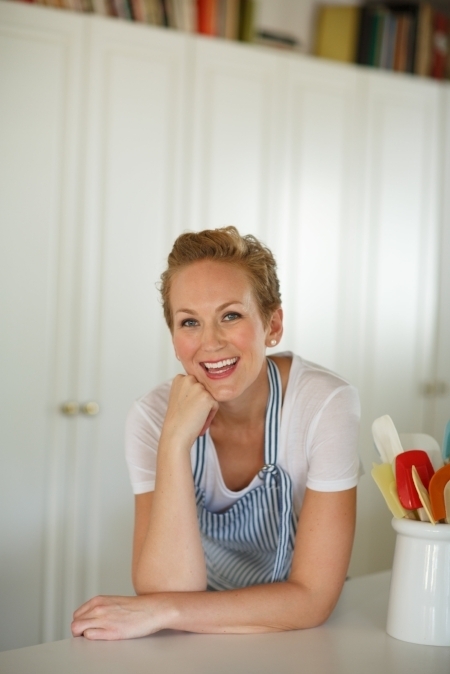 Now, come join me on this hasselback bandwagon and let’s get cook’n! Definition: First of all, I should make one note…hasselback potatoes are easy to make but require a little time and patience. In summary, and in its’ simplest purest form, hasselback potatoes are sliced across the entire potato from one end to the other without your knife cutting all the way through the bottom of the potato. So, when you hold up the potato, it stretches like an accordion which is why some people call this style of potato an accordion potato. Simple enough, right? Potatoes: Yukon are my favorite, but russet, red potatoes and my personal favorite, Melissa’s Produce Fingerling Potato Medley, will all work just as well. The fingerling will take longer to prep as they are smaller and have to be done one at a time, but they are so darn cute you may just want to take the time! Chopsticks! There are a few things that will make this easier and they involve taking an extra set of chopsticks on your next sushi takeout order. That’s right, chopsticks! Chopsticks are just thick enough that they will act as an aid when slicing your potatoes. If you think about it, chopsticks are the perfect–cheap–option for stopping your knife blade from cutting all the way through the potato and severing it in half. Sharp Knife: This part is important as you want to cut through your potato in smooth strokes creating even width slices across. A dull knife is not only an unsafe knife, it can make it hard to cut through…remember, this potato isn’t cooked yet. Patience: This may take a while, especially if you are doing the fingerlings, so pour yourself a glass of wine, tea, coffee or beverage of choice, crank the tunes and enjoy the process. 1. Scrub your spuds with a potato scrubber. 2. Starting with one potato at a time, line up your chopsticks like guardrails, on either side of the potato. 3. Taking a sharp knife, start at one end and cut all the way across the diameter of the potato stopping when the knife hits the chopsticks. Repeat these steps, spacing ¼-inch to ½-inch apart. 4. Repeat this process with all potatoes. 5. Line a baking sheet with parchment paper and place potatoes on top. 6. Generously drizzle oil across each potato opening the cracks to ensure oil is coating inside the slits too! Season with salt, pepper and herbs or spices of choice if using. 8. Remove, allow to cool and sit back as the praise comes flowing in! When it comes to a festive New Year’s, its important to stock the bar cart with an element of sophistication while not breaking the bank – or countless hours of sleep. Today I offer my top tips for a fully stocked, festive and show stopping bar cart primed for your guests every wish. To keep things simple, offer a signature cocktail that is pre-mixed and only in need of a shake, stir or few ice cubes to finish. By streamlining the bar cart – remember, less is more – you minimize clutter and spillage all while keeping your costs down. If you would like to take your bar cart to the next level, keep a supply of the basics like prosecco, whiskey, brandy, vodka, and even sparkling cider from which your guests can choose from. While on the subject of sips, consider offering a hot cider or mulled wine for those looking to take off the cold chill from their commute. Don’t forget tonic water, club soda and freshly squeezed orange juice or grapefruit juice as well! Bitters, cherries, orange peels, simple syrup…consider your options and have fun with it. Heck, pomegranate seeds for your prosecco is another simple and festive way to take ordinary to extraordinary levels. Depending on available drinks, have a collection for glasses available for guests to craft their drinks in. Prosecco? Champagne flutes. Old fashioned? Rocks glass. Use the right cube for drink. Crushed ice simply won’t do with your scant of brandy – plus it melts faster – in your rocks glass. P.S. don’t forget that ice scoop and bucket! Always have cocktail napkins on hand. One way to help adorn the bar cart, is by using festive holiday themed napkins which are both useful and practical. From festive colored straws, umbrellas, fancy bamboo pics skewered with olives or cherries, or really whatever may suit your fancy, have a collection of stirrers and straws to adorn even the simplest of sips. Cocktail shakers, stir sticks, strainers, muddlers, lemon or lime juicers, peelers…don’t forget the details because each and everyone make the difference in your overall success! A small vase of flowers, Glassybaby’s, bowls of gold and silver M&M’ – don’t forget the spoon – and even outlining the bar cart with fresh garland, you immediately take your cart to a whole new level with minimal effort. Now that you have a fully stocked bar cart, prepare yourself for an incredible evening as you cheer to 2016 and toast to 2017! Homemade Edible Gifting: Quick and Easy Recommendations for Giving the Gift of Food this Holiday Season | Tuesday’s Tip of the Day! This holiday season, consider giving the gift of food! Whether homemade fudge, caramel sauce, candied nuts, or peppermint bark neatly nestled in my favorite weck canning jars, giving the gift of a homemade creation is one way to make a memorable impression. 1) Make your selection! Determine what you would like to make and try a test run. There is nothing worse than making your treats, packaging them and realizing they aren’t shelf stable, for example. This is your chance to make sure that your edible gift, truly will make a positive impression. 2) Canning Jars: Select and purchase the appropriate size canning jar for creation – i.e. a wider canning jar for peppermint bark and fudge, and a slender jar for caramel sauce. It’s also important when considering the size of jar, to commit to filling it to the top. Make sure you know exactly how much fudge, for example, is needed to fill that jar before committing to its size. Kitchen stores, like Sur La Table, offer a great selection of canning jars while Amazon offers an even extended variety. 3) Label: Determine how you want to label your creations. Whether using a traditional label maker, hanging gift cards tied around the top, or chalk board stickers, make sure they work with the canning jar at hand. 4) Shop: Figure out exactly how many batches of treats you need to make to fill the chosen mason jars, make your shopping list, and head to the store! 5) Time to Get Baking! Once you have made your sweets, make sure they are at room temperature before securing the lid. Regardless of what you have made, be mindful of where and how you store and transport your gifts. 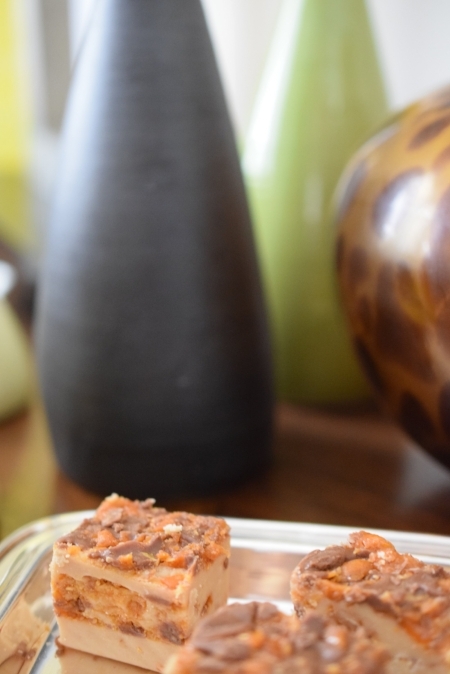 For other terrific tips and hundreds of recipes, including several for gifting, like my Chocolate Pecan Fudge, Foolproof Caramel Sauce, Spiced Nuts, and Peppermint Bark, to name a few, visit my website (thetabletogether.com). While there, consider “subscribing” and I will send a new tip or blog post directly to your inbox every Tuesday and Wednesday morning! 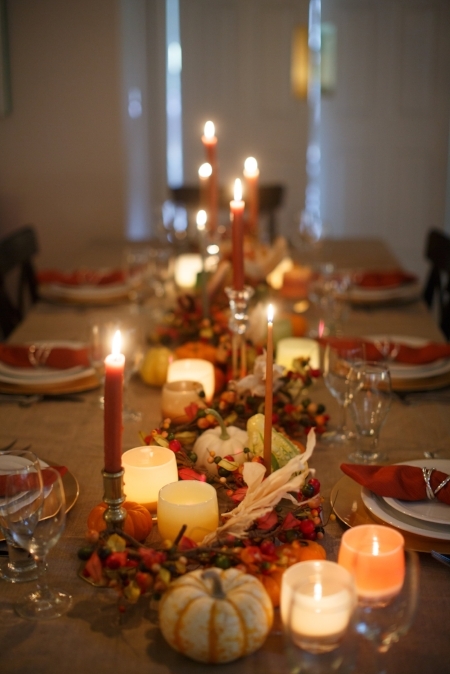 Thanksgiving Etiquette: How to Attend an Unforgettable Thanksgiving Feast | Tuesday’s Tip of the Day! Whether hosting or attending Thanksgiving, one thing is for sure; preparing for the big feast takes planning, attention to detail and hours behind the cooktop. If you are planning on gathering around someone else’s table this year, let me offer some suggestions on attending an unforgettable Thanksgiving feast with grace and style! 1. There is nothing worse than hosting dinner, timing all your courses and guests are late! 2. Do what you need to do to be there on time. It really is the least you can do! 1. Don’t even think about showing up empty handed! If you ask and they say, “nothing, bring yourself” DON’T! 2. A bottle of wine is a great start, but think about something in addition to that top shelf reserve that will serve as a wonderful memory of a delicious evening shared around the table together with family and friends! 3. Matching fall-centric aprons for the host and self, for example, is one sure way to make a lasting impression, an especially useful one too! 4. If they ask you to bring something to share, think about bringing your homemade creation in something lovely to leave behind. Not only does it serve as a hostess gift, it makes transporting your item that much easier without worrying about collecting it after the evening’s feast! 1. Especially with all the courses that come with a classic Thanksgiving feast, as soon as you arrive, roll up those sleeves and ask what you can do to help! 2. From filling water glasses, lighting the candles or decanting the wine, another set of helping hands is always greatly appreciated! 1. Yes! You may want to roll into your gathering with a flexible waste-band, but what I mean is flexible in terms of execution. Not everyone has a formal dining room or table so come with the intention of eating off your lap and relish in it! What really matters is that you are surrounded by family and friends anyway, right? 1. We all dread those dishes, but they aren’t going to wash themselves! 2. Whatever you do! Do not leave your host stuck with a mess! They may prefer to do it themselves, but at least help by clearing the table, scraping the food off the plates and neatly stacking the dishes for easy cleanup. 3. Ideally, pour yourself another glass of wine, ask to borrow an apron, and continue the conversation around some soapy suds. 4. And while you are at it, offer to take the trash out too! 1. This may seem old school, but send your host a thank you note, hand written if possible! Some traditions never die, and this definitely shouldn’t be one of them! For other terrific tips and hundreds of recipes perfect for that leave-behind casserole or pie dish, like my Cornbread Stuffing, Mashed Sweet Potatoes with Marshmallow and Pecans, or Pumpkin Pie with Gingersnap Crust, visit my website (thetabletogether.com). While there, consider “subscribing” and I will send a new tip or blog post directly to your inbox every Tuesday and Wednesday morning! Thanksgiving Grocery Shopping Made Easy with These Simple Steps | Tuesday’s Tip of the Day! Before you drown a double espresso and brave the grocery story, consider these simple steps to make your trip as smooth – and quick – as possible! A true winning combination come Thanksgiving! The week leading to Thanksgiving, try to eat through your fridge as best as you can! With all the veggies – and that hefty bird – you need all the real-estate you can get! Write a Shopping List: Don’t even think about going to the grocery store without a thorough shopping list! Check your cabinets – as well as expiration dates on those herbs – and account for items you already have replenishing with those that you don’t. Having a plan keeps you focused and on a mission at the store. It also keeps impulse purchases at bay while ensuring all ingredients are accounted for. Don’t forget cleaning supplies, including sponges and scrubbers as well as detergent for your dishwasher, garbage bags, ziplock bags, to-go containers for leftovers, foil, plastic wrap and of course, cooking twine, meat thermometers, coffee pods for your nespresso including cream and sugar, oil, butter and jam for those steaming rolls, salt and pepper! They often don’t make our shopping list because we are so focused on the food, but boy are they important for the overall success! Make sure you account for where everything is going to go once home, including that 12 + pound turkey, veggies, wine, dairy, pumpkin pie, whipping cream, etc. Once you arrive home with your groceries, you should know exactly where the turkey is going and that it is stored safely in consideration of your produce and anything else that has the potential of coming in contact with it. Tour Your Store Before Shopping: We all know our grocery stores, and if you don’t already have a relationship with one, I definitely recommend paying your local store a visit before you shop. This way, you can get the lay of the land and build your shopping list according to how the store “bundles” items starting with dry first and perishables last to keep them at their prime. This also gives you a nice foundation as you know exactly where the produce section is, that the wine is in the back left corner, adjacent to the baking aisle and dairy section, for example. Categorize: Write your list according to the order in which you will shop (dry first, perishables and ice cream last), and in bundles. I create an excel sheet with categories: Protein, Dairy, Baking, Dry, Alcohol, Produce, and Home-Goods (Ziplock, foil, soap, etc.). This way, I can shop for everything in that category at one time. How to Shop: Shop for dry non-perishable items first and work your way toward produce, dairy, flowers and other “fragile” items last. Also make sure your flour, sugar and other dry items don’t get wet from those leafy greens and make sure you keep the eggs on top. And the Turkey…that should go under the cart on the “rack” or “shelf” all by itself so that it doesn’t have the potential of cross-contaminating with your produce. Essential!!! Cross off your list as you go and highlight those items you may need to come back for or shop elsewhere for. I find that I shop a few stores around the holidays because I like the stock at Trader Joes, the rolls and cinnamon rolls at Blue Chair Bakery – which travel with me from Balboa Island to Seattle – and proteins and veggies at QFC. Cross-body bags are the best because you can carry more and it doesn’t hurt your hands. Even if you have a few cross-body bags, it frees up your hands for a few more bags, or a double shot espresso! Comfy shoes, sweater if your store is as cold as mine, and a purse that you can wear cross-body so you don’t have to worry about leaving your cart unattended. Be Patient! Don’t go shopping if you’re on a tight timetable! Rushing through your shopping only causes panic and anxiety which is the key ingredient for purchasing the wrong item or forgetting it all together. Unless you are interested in making a few additional – and unnecessary, should I add – trips to the store, carve away a chunk of time where your shopping list has your full attention. Don’t let your greens wilt and turkey defrost in your car! Plan on grocery shopping after all your other errands so you can quickly put things away when home. Now that you are fully equipped to take on your Thanksgiving shopping, I encourage you to start writing your list today! It’s never too early to plan your Thanksgiving feast! For other terrific tips and hundreds of recipes, including several classic Thanksgiving recipes like my Ultimate Thanksgiving Turkey, Pumpkin Pie with Gingersnap Crust, Cranberry Relish as well as Cranberry Sauce, and Sweet Potatoes with Marshmallows and Pecans, visit my website (thetabletogether.com). While there, consider “subscribing” and I will send a new tip or blog post directly to your inbox every Tuesday and Wednesday morning! Everyday Serving Pieces for Any Occasion | Tuesday’s Tip of the Day! When it comes to entertaining, I always tell my clients that serving pieces are items we collect overtime. Yes, we all need a basic inventory of serving pieces to get started, but this “basic” collection will no doubt grow as our space, expertise and desire expands. Here are a few everyday serving pieces, perfect for any occasion. Bowls: When it comes to serving bowls, its important that we have different sizes ranging in varying widths and depths. A shallow serving bowl can make a gorgeous serving vessel for pasta night, where a deep serving bowl is best suited for a salad. Think outside the box when it comes to bowls and don’t be afraid to repurpose and reuse. Platters: From oval, square and round, think about 1 of each for maximum use and versatility. A few different sizes, starting with your current entertaining style (small gatherings vs. large gatherings) and building from there. Serving Utensils: Make sure you have a collection of serving spoons (slotted too), forks, and tongs as well as pie servers and knives for your desserts. Mason Jars: These can come in real handy! From cocktail shakers, vases, hurricanes and a vessel to hold utensils for casual entertaining, not to mention a paper napkin weight for outside entertaining, mason jars constantly save the day in my household. Plus, since they are so inexpensive, consider having a collection of different sizes to add dimension for any purpose or occasion. Pitchers: You can use the same pitcher for water as that sweet ice tea, just make sure you have a few so that you can serve from both at the same time. When determining what size to purchase, think large enough so you don’t have to keep refilling but small enough so they easily nestle in between tablescapes and those gathering around the table together. Cooking Vessels and Everyday Kitchen Staples: You don’t always need a traditional serving vessel to serve from. Think about serving cheese and crackers, as well as that delicious garlic bread, right off a cutting board (if it’s a nice looking one) and soup straight from the saucepan! Not only does it bring people together and make the entire evening more “homey”, its repurposing what you do have without anyone knowing the difference. With this foundation of everyday essential serving pieces, you equip yourself with the necessary tools for entertaining in style! Mason Jars: My 5 Favorite Uses | Tuesday’s Tip of the Day! From canning, to serving as vases, hurricanes and cocktail shakers, mason jars are all the rage! Today, I am going to share my top 5 uses for purchasing a collection of mason jars on your next visit to the superstore. 1. Vases: Mason jars make for great vases as they immediately add character. Consider scattering a collection of varying sizes and shapes across your fireplace mantel, dining room table, bedroom dresser or coffee table. Not only do they make a fun and unique addition, they are inexpensive and easy to wash and store. 2. Hurricanes: Add a little sand, insert votive, light, voila! Think about an entire slew of mason jars in all varying sizes using battery operated votives if outside! 3. Cocktail Shakers: Who needs a fancy cocktail shaker when you can use a mason jar. Insert ingredients, top with ice, secure the lid and shake. Plus, a few mason jars on your cocktail cart adds a nice youthful touch. 4. Making Vinaigrettes: Instead of slowly incorporating your oil while whisking, that alone takes some coordination, add everything to your mason jar, don’t forget that pinch of salt and pepper, secure the lid and shake. Taste, adjust, serve! Plus, leftover vinaigrette can remain in the mason jar until the following day. Why dirty another dish, right? 5. Shaping your graham or gingersnap crust for Thanksgiving (since it’s just around the corner) pies! Yes, this is an unusual one, but if the bottom of your mason jar is flat – as in, not indented in the bottom – simply press down in your 9” round pyrex, including the corners and sides, to give structure minus the finger indents. P.S. Since we are on the topic, and just in time for Thanksgiving, check out my recipe for Pumpkin Pie with Gingersnap Crust! For other terrific tips and hundreds of recipes, including dozens for Thanksgiving like my famous Parker House Rolls, Cranberry Sauce and Relish, Green Beans, and even a super simple Turkey, visit my website (thetabletogether.com). While there, consider “subscribing” and I will send a new tip or blog post directly to your inbox every Tuesday and Wednesday morning! Happy (almost) New Years! I really can’t believe it has been a solid year since well, last New Years! Where has the time gone? Although I honestly can’t tell you where the last year has gone, I can tell you how to successfully ring in the New Year surrounded by those that you love! My proposal? Why don’t you host this years New Year’s Celebration! 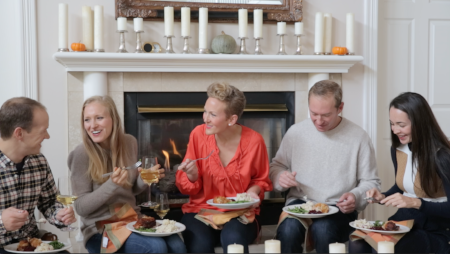 There is nothing I love more than inviting my friends and family over and gathering around The Table Together! Regardless of whether it’s a summer BBQ and pickle ball tournament (which quickly turns into an all-day/night affair) or winter gathering with mulled cider around the roaring fireplace, I just love hosting friends and family in my home! New Years is a great way to celebrate with family and friends, be thankful for what we have and look forward to what’s to come. Simply follow these steps, by first sending “save the dates” and you will be ringing in the New Year in just a few short days! 1. Guests: Invite them now! And before you think “New Years is in just a few days,” don’t worry! I often don’t have my New Years plans secured until a few days before and would love seeing an impromptu invite come in! 2. Menu: Be realistic with timing, shopping, kitchen space, and the robustness of the menu. Yes, we would all like to serve a plethora of tapas at our New Year’s party, but realistically, do you have time in the next 2 days to plan, shop and cook all of them? Pick a few of your favorites, that you have done before, and focus on those! Sometimes less is more…if you know what I mean. 3. Shopping: Before you head to the store, write a shopping list to account for your entire menu, including any staples you may have gone through on Christmas Day, like cleaning supplies, plastic wrap, foil, olive oil, salt, pepper, wine, cider, mulling spices, etc. Make sure you include them on your list so your one stop shopping stays at one stop! 4. Ambiance: Leave your holiday decorations up until January 1. They are festive, merry and bright (tis the season after all!). 5. Music: I would recommend not playing your favorite Christmas carols because it really is (as tears form in my eyes) time to move on (but don’t tell anyone if you see me cruising down the street to Rod Stewart and Dolly Parton’s Baby It’s Cold Outside blasting through my stereo!). Spotify and Pandora offer great New Year’s Celebration mixes that would be perfect for your party. 6. Playing Games & Starting a Tradition: In my family, we always spend a few minutes over dinner, or the week before, writing down our New Year resolutions for the following year. They are then individually sealed with our names written across the seal helping to resist any peeking. They are then secured in a large envelope until the following year where we gather around The Table Together, privately read last years and write a new list for the following year. It’s a fun exercise for all ages and one that I look forward to re-visiting every year. Plus, if you have goals written down, you really don’t want to let yourself down by coming in short. Right? And with that, guests are invited, menu is planned and shopped for, your home looks fabulous, music is playing and traditions are forming. Until next year, I hope one of your New Year resolutions is cooking more and as a result, finding more opportunities to gather around The Table Together with those that you love. For other terrific tips for cooking at your best, subscribe to my blog and I will send them straight to your inbox every Tuesday morning! Giving the (Last Minute) Gift of Food | Tuesday’s Tip of the Day! Can you believe after all these weeks of braving traffic, fighting for parking spots and long lines at the malls, Christmas has arrived? I sure can’t! Today I am going to share some of my favorite last minute “giving the gift of food” shopping tips! And at the end of the day, these ideas can apply to more than food! All it takes is a little imagination, some patience and dedication to crossing those names off your list…in 3 days. Grocery Stores: Grocery stores offer a plethora of ideas for last minute shopping! From gift cards, wines, olive oils, vinegars, finishing salts, teas, coffees, and even treasures from the specialty aisle, don’t over estimate the ease and convenience (plus late hours of operation) of your local grocery store! Gas Stations: If you are in a true pinch for time, most gas stations carry gift cards for restaurants or even local grocery stores or chains. And if that doesn’t work, a gift card to Home Depot, for example, isn’t a bad idea as maybe it’s time we start looking at that kitchen remodel after all, right? Pharmacy: From specialty nut mixes to oils, wines and candies, you never know what might line those pharmacy shelves! Plus, the lines are typically much shorter at your pharmacy store than your grocery or department stores. A much welcomed sight come the holiday mayhem! Department Stores: If you are already downtown, don’t overestimate the home-goods section at major department stores where beautiful platters, oil canisters, peppermills, mixing bowls, espresso machines, aprons, linens, and even major brands like Le Creuset and a slue of items from Martha Stewart’s collection line the department shelves. Some of them may even carry specialty candies, oils and mixes. Kitchen Stores: Stores like Williams Sonoma and Sur La Table offer everything the chef in your life loves including cookbooks, prepared sauces and mixes, spices, linens, cocktail mixers and even classes (in some locations). Restaurants: While your taking a break from all your holiday shopping, check to see if your restaurant offers a cookbook, specialty oils, spices, or even cooking classes or special tasting menus! You just never know! Now that you have 6 fresh new ideas to consider, it’s time to start shopping and crossing those names off your list! However you plan to celebrate this year, I hope that you find joy, love and comfort in gathering around The Table Together with those that you love! For other terrific tips and recipes for cooking at your best, subscribe to my blog and I will send them straight to your inbox every Tuesday morning! 10 Days Till Christmas | Tuesday's Tip of the Day! With only 10 days until Christmas, for those that are celebrating, it’s time to “Deck the ‘home’ with balls of jolly la la la la la la, la la la la.” Maybe that’s taking it a little to far – sorry I couldn’t help myself – but it’s time to decorate your home, adorn the dining room table, plan your perfect menu and invite your friends and family to gather around The Table Together. Here are a few quick tips and reminders for hosting the most memorable Christmas yet! 1. Enlist some help! Yes, I know you have this covered but no one will think any less of you if you ask for some help! People genuinely want to help, and by doing so it makes them feel a part of the occasion. Before you say no, think of something for them to do whether bringing a bottle of wine, helping with the music playlist, writing name cards, manning the bar or helping during service. Plus, by taking a few items off your to do list, you have a few more minutes to take care of the little details, like what service ware to use and how you want to adorn the table! 2. Start today! It is never to late to set the table, write the shopping list or order the beef tenderloin. Do as much as you can today allowing yourself more time next week to focus on the bigger items, like cooking and greeting your lovely family and friends. 3. Guests: Make sure all of your guests know when they should arrive and what they should bring (if applicable). I like giving everyone a job, even if minor, so that they feel included in the festivities. 4. Miscellaneous items: As we discussed over Thanksgiving, take inventory of your staples. Do you have enough garbage bags, sponges, dish soap, paper towels, clean dish towels, ziplock bags, foil, plastic wrap, salt, pepper, oil, etc.? And with that, let the countdown begin!! !